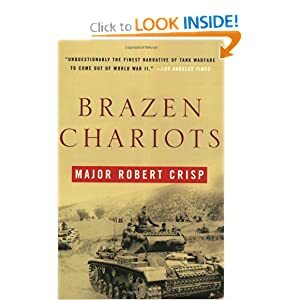 It isn't fiction, Major Crisp's story of the armoured war in North Africa has all the hallmarks of great fiction. It's hot here today. Unusually so. I couldn't help but think of the smell of North Africa in June for no good reason at all. If you want riveting narrative, Major Crisp has it. If you want to identify and humanize characters, he does it. If you need suspense, thrills, and first person accounts of mayhem and chaos, he has it. If you want fear - well. It's there too. Of all the space yarns I've read, none of them has had the immersion of this tale. I have no knowledge of war on the surface of the desert in unreliable chunks of steel better suited to making bread than housing troops. I don't know anything at all about this world of the book yet I'm there with the troops hoping that the column of German armor passes us by. If I could write science fiction that was as immersive, I'd never want for readers. I am descending to the cave of the cool for a little reading tonight. It's warm in the library and while that is a good thing, it doesn't suit me right now. I'm moving for whim. I should have charaters do a little of that, too. Many of mine are nearly statues. I hope you're reading. Try a fabulous tale of North Africa and the horror of armor. Being the "big gun" makes you the "big target."